Julie Drew, with her husband and four children, live in Edmonton, AB Canada. She is a professional artist. She earned a Bachelor degree in Fine Arts from Pacific Lutheran University in Tacoma, WA in 1987, and she has been painting and teaching art for over 20 years. Julie's primary mediums are watercolour, colour pencil, and ink, plus several of her paintings are done on her own handmade paper. Her art has been displayed in many galleries and organizations, and has been purchased for private collections in Canada, the United States, Australia, and France. 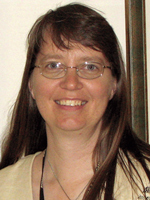 Julie has also been a church leader and, for several years, a pastor's wife. Her ministry focus is worship leading and discipleship. For Julie, art is an exploration into God's creation and into God Himself. God reveals himself in His creation, both his character and his mystery. Art is a language of the heart and soul, coming out of the feelings and emotions as well as the intellect. 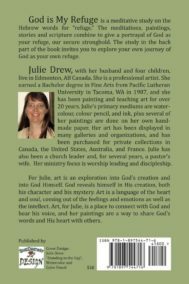 Art, for Julie, is a place to connect with God and hear his voice, and her paintings are a way to share God's words and His heart with others. God is My Refuge is a meditative study on the Hebrew words for "refuge". 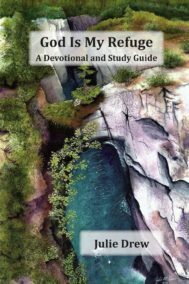 Includes devotional and study guide.